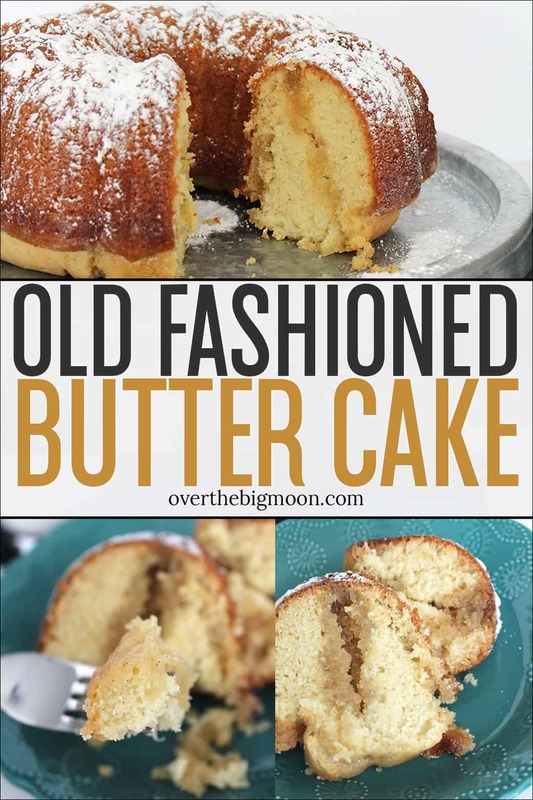 Old Fashioned Butter Cake is a classic cake recipe that you’ll pass down for generations! It’s moist, full of flavor and a recipe you’ll keep forever! No frosting is needed! You guys are seriously going to thank me for this recipe! I was honestly in a little in shock that I had forgotten about it and not shared it with you sooner. 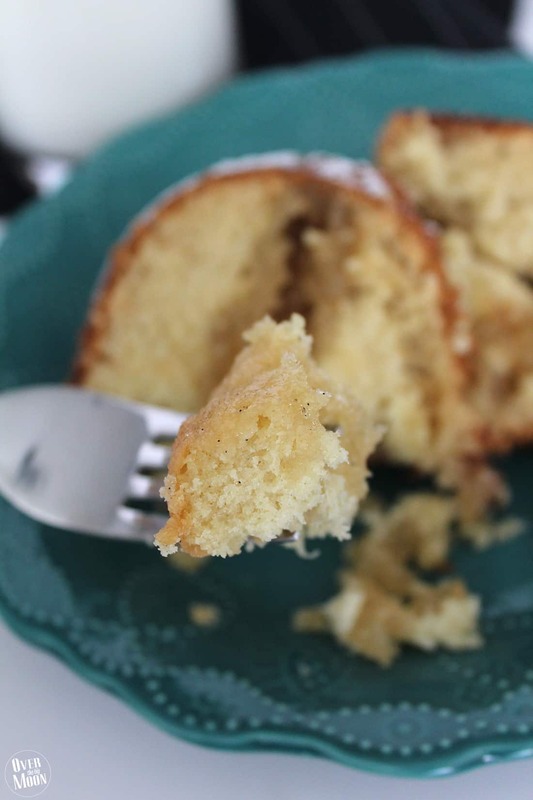 This recipe is from my Grandma and one of those secret gems that every time you eat it, you wonder why you don’t make this every time you need or want a cake! It legit melts in your mouth! 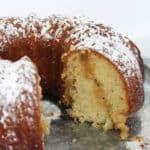 IS OLD FASHIONED BUTTER CAKE HEALTHY? Is it a guilt free dessert? Absolutely NOT! But, honestly, you won’t care the second you take your first bite! Do you see those strips of butter drip down the cake piece? It literally melts in your mouth! Make sure to check out these other great recipes too! 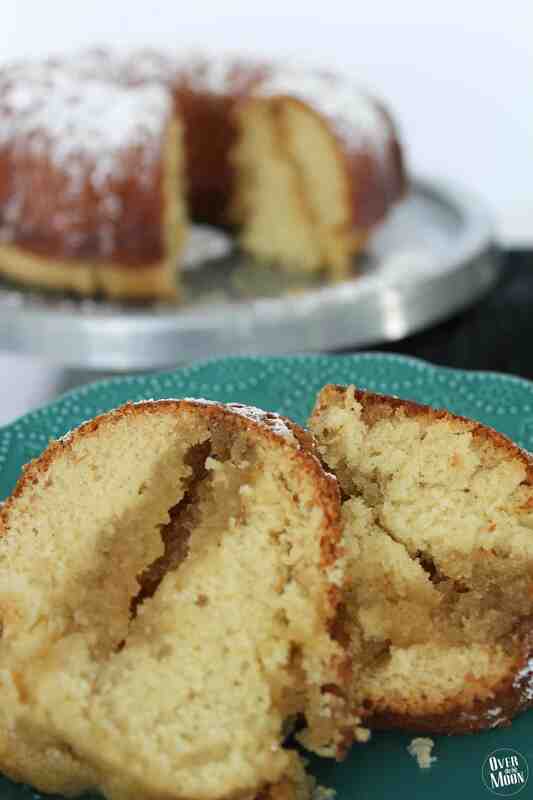 A super moist a delicious buttery cake! Preheat your oven to 325 degrees. Also, take your bundt pan and then grease and flour it. In a large bowl, combine the try ingredients: 3 cups flour, 2 cups sugar, 1 teaspoon salt, 1 teaspoon baking powder and 1/2 teaspoon baking soda. Mix all together until well combined! Blend in the 1 cup + 2 tablespoons buttermilk, 1 cup of butter, 2 teaspoons of vanilla and 4 eggs. Beat together with a mixer for 2-3 minutes at a medium spoon. Pour into the bundt pan. Bake for 60 minutes or until a toothpick is inserted into the cake and comes out clean. During the last 10 minutes of the cake baking, go ahead and put together the butter sauce (directions below). Immediately on removing the cake, prick holes into the cake and slowly pour the butter sauce all over the cake. Allow the cake to cool completely before removing it from the pan. Immediately on removing the cake, prick holes into the cake and slowly pour the butter sauce all over the cake. Allow the cake to cool completely before removing it from the pan. In a saucepan combine the remaining 3/4 cups sugar, 1/2 cup butter, 2 teaspoons vanilla, and the 3 tablespoons water. Cook over medium heat, until fully melted and combined, but do not boil. You can finish the cake off with a little powdered sugar! I love using my Chef’s duster to apply it! 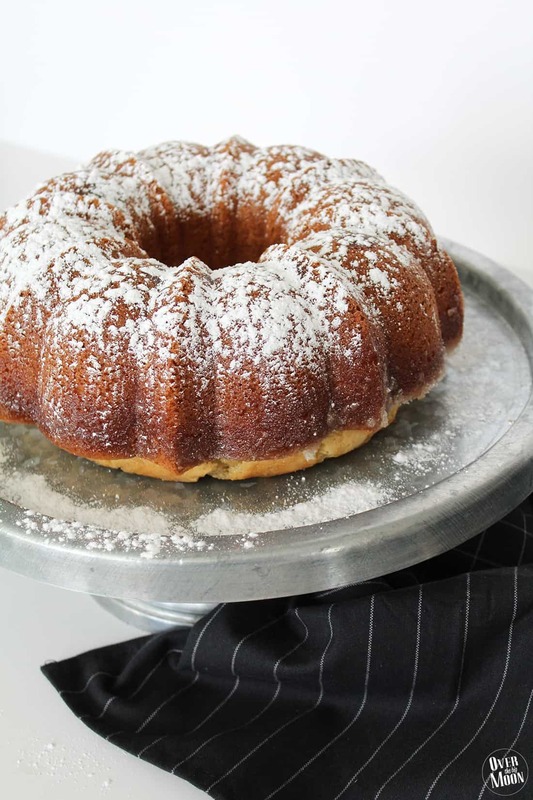 PS – I just ordered this Heritage Bundt pan and I can’t wait to use it! It’s sooo pretty!! I can’t wait for you to try this! You will LOVE it! This post was originally posted in March 2017 and has been updated! We absolutely LOVE this recipe! I wish I could eat it every day! Thanks for sharing! This reminds me of my grandmother! I can’t wait to make this! This looks delicious! Can’t wait to make it! That cake looks heavenly!! Especially, that drip of butter in the middle!! It looks so soft & perfect for any gathering! While I struggled to get the cake out of the pan and it kind of came out in chunks, no one cared because it is so delicious! To serve, I added some dulce de leche and microwaved briefly, then added vanilla ice cream and a bit of cherry pie filling. So yummy! That sounds amazing and I’m so glad everyone loved it! I’m sorry it struggled coming out. I generously crisco or butter the sides and then add flour on top of that and I have had much better results! Hope that helps! The instructions don’t specify the consistency for the use of the butter. Soften or melted?